Early morning birdsong mixes with the crunch of fine gravel beneath my bike tires. As I hug the curves of the Root River, the rising sun feels hot for early May in Minnesota. Already, a thick blanket of green has spread across the sides of bluffs, over the rolling hills and into treetops shading the trail. I ride for several hours in silence and solitude, save for occasional deer or wild turkey eyeing me from the surrounding fields. 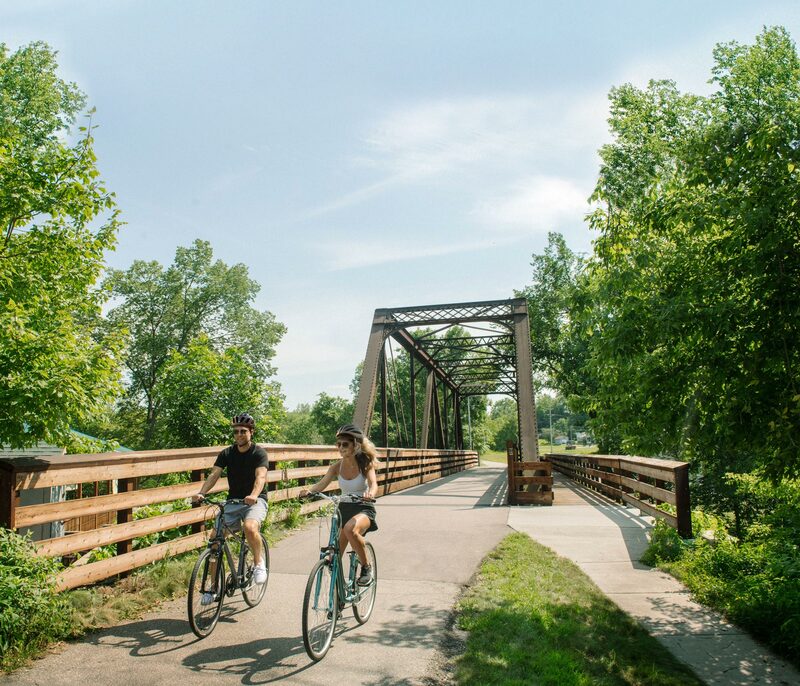 The Root River trail system spans 60 miles, connecting nine communities, with Lanesboro at its heart. By late June, this 750-person town doubles in size each weekend. Tourists wearing bike shorts and fishing waders flood the trails and trout streams. But right now, the Root River Valley is operating at a quiet hum. To wit: Richard Nitz, Lanesboro’s resident Buffalo Bill impersonator, has time to let his beer grow warm in the sun while dishing with me about the town on the back deck of The High Court Pub. Thirty years ago, the state reclaimed a rail line for cycling before the trend caught on nationwide. 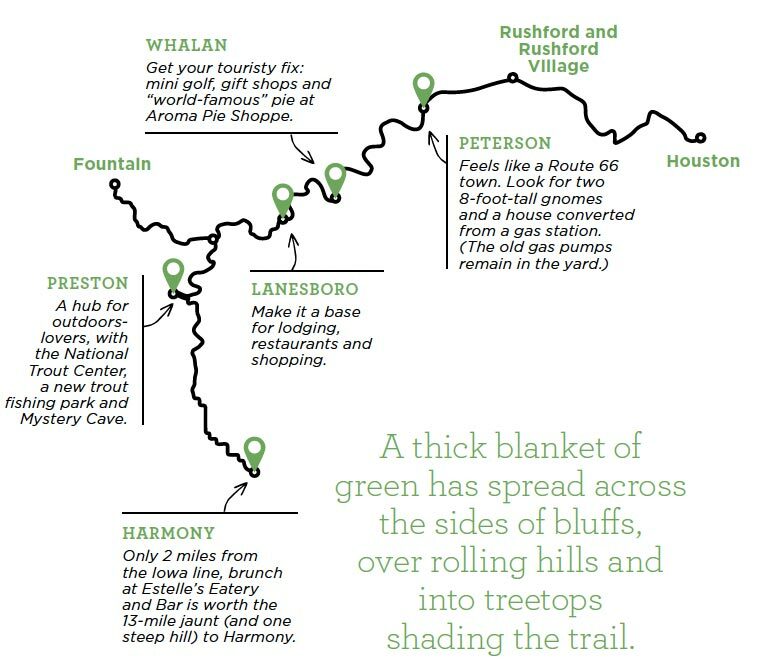 As the trail network has expanded, so have the attractions in the area. 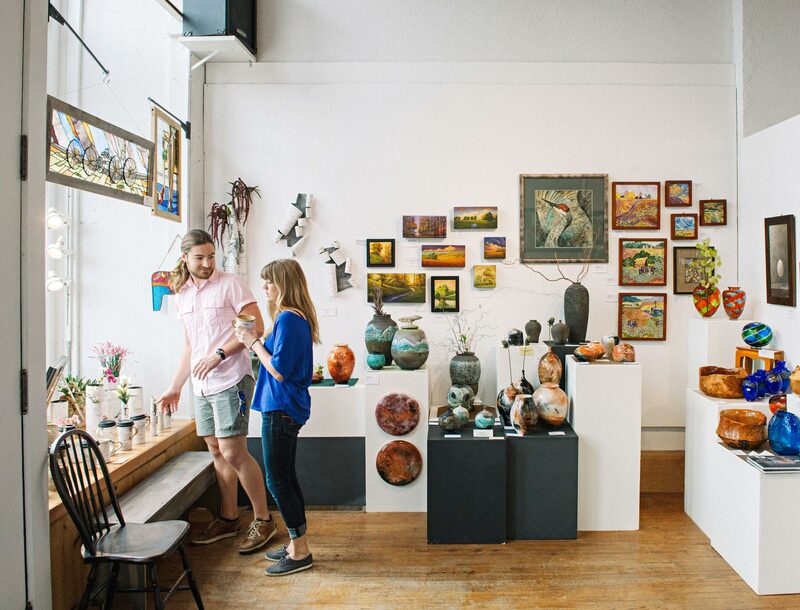 You’ll find art galleries, theater, fresh dining choices, even a cool cave tour and novel trout stream—almost enough for a wholly bike-free weekend. Although what a shame that would be. 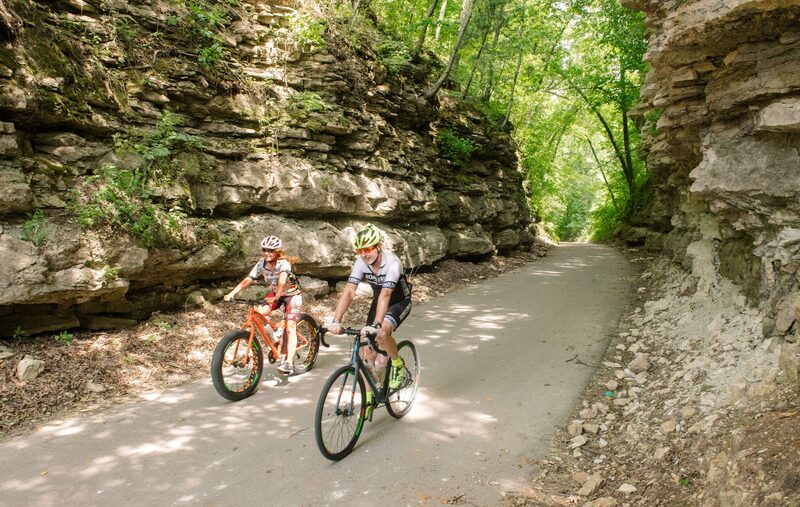 Along the trail, watch for wildlife, barns dotting the countryside and scenic river overlooks. Follow Camp Creek The Harmony-Preston trail section traces a tributary to the Root River. Trail markers tell of the area’s environmental and cultural epochs. Book a shuttle Little River General Store in Lanesboro will drop you and your bike in Harmony for a 21-mile ride back to home base. On weekends, a mess of bikes marks these spots for bites and drinks. Estelle's Eatery and Bar is a modern cafe on Harmony’s Main Avenue. Beef comes from a farm down the road. Try it as a burger dressed up with goat cheese, arugula and blackberry jam. The Bite’s chalkboard in Lanesboro lists sandwiches, salads, house-made potato chips and desserts to end a long ride. The High Court Pub serves up seasonal flatbreads, cocktails and craft beer in Lanesboro. Prime patio seating overlooks the river. 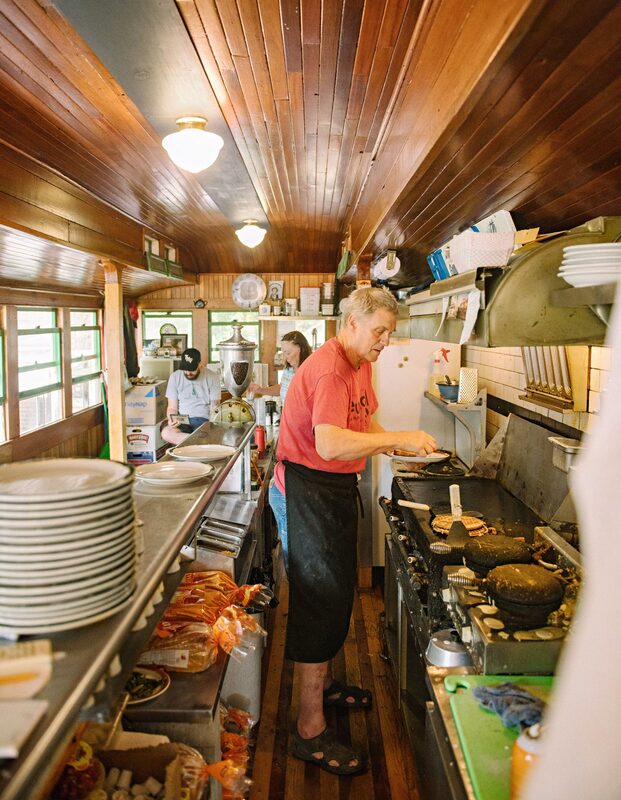 Spud Boy Diner in Lanesboro dishes comfort-food breakfast and lunches in a restored 1926 wooden dining cart. 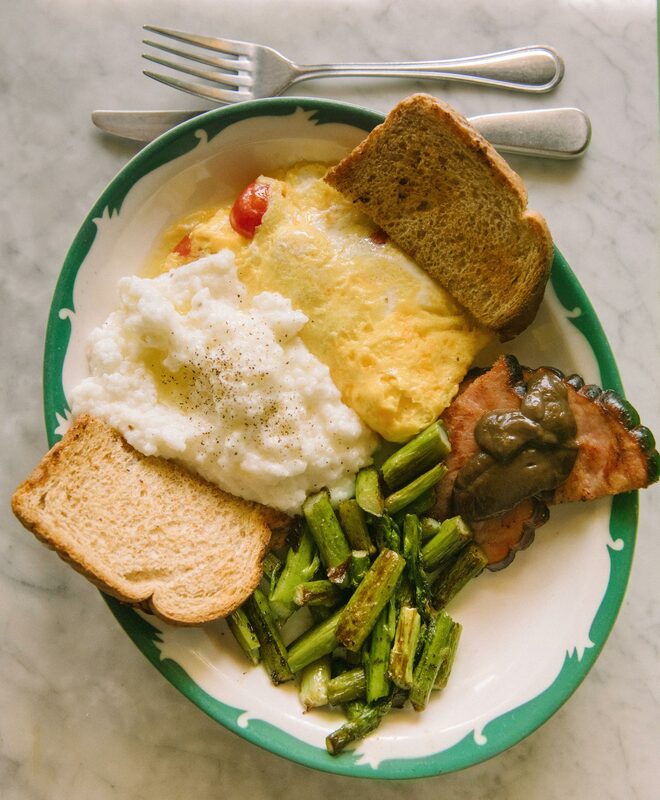 Breakfast (below) and a bustling kitchen (above) at Spud Boy's Diner in Lanesboro. Bluffs along the Root River Trail. Lanesboro is B&B central. If that’s not your jam, try these. Old Barn Resort offers a campground and hostel, plus a golf course, a pool and tubing between Lanesboro and Preston. The namesake barn houses a restaurant and music venue open to anyone passing through. Stone Mill Hotel and Suites turned an 1885 Lanesboro feed mill into 13 themed rooms, preserving some original equipment inside. Iron Horse Outfitters and Inn’s four rooms embody steampunk style above a motorcycle shop. Ask about scooter rentals or a tour on the region’s back roads. Park the bike for a morning or afternoon of play and exploration. National Trout Center’s 9-Hole Fishing Course opened last year in Preston. 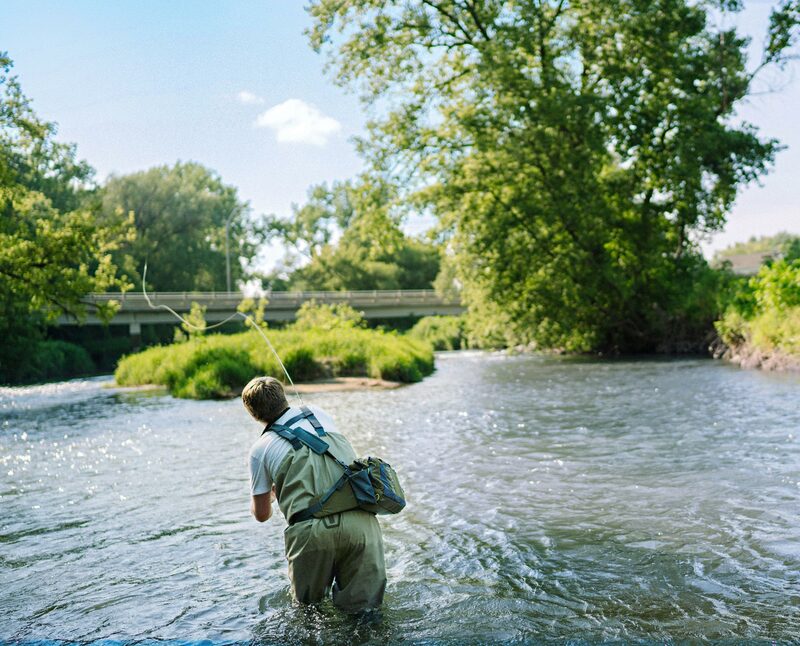 Fish hide in spring-fed pools and swift currents, where anglers can hone casting techniques. Each hole presents unique features for beginners and experts. Gear rentals and workshops are available. Wetting a line at Preston's 9-Hole Fishing Course. Forestville/Mystery Cave State Park includes a 12-mile maze of subterranean corridors west of Preston. Tours range from an easy 3⁄4-mile stroll to a 4-hour crawl-on-your-belly expedition. Above ground, you can explore tallgrass prairie, bluffs and the village of Forestville restored to its 19th-century appearance. Windy Mesa in Lanesboro features a unique collection of horsehair pottery. This beautiful style of Navajo art uses actual horsehair in the firing process, melting it into the pottery and creating a marblelike finish. The Lanesboro Arts Juried Sales Gallery showcases works by more than 90 artists from Minnesota, Iowa and Wisconsin. Browse beautifully displayed photography, jewelry, ceramics and literature. Lanesboro Arts' gallery features work by many area artists. From left Bluffs along the Root River Trail.